The season of sun is going to be here sooner then you think so if your in the need for more slides sandals or just want more this find is for you. These SOPHIA WEBSTER “Phoebe” leather slides are a premium sandal from Sophia Webster’s Spring ’17 collection that are inspired by ’60s music and films. 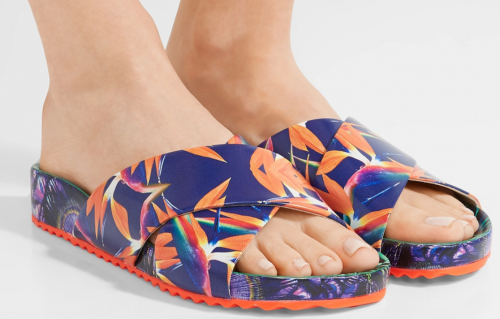 Crafted from smooth leather, they are printed with a vivid tropical motif set on a bright-red gripped soles. Wear them on vacation to the pool or lunches but they will bring a special vibrant vibe to your look. Go HERE to get your pair today.